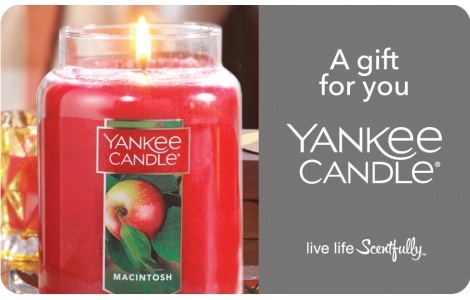 Yankee Candle® is the world’s best known and most often chosen brand of premium scented candles. Our candles and our seasonal lines of décor accessories are all, at heart, about creating a sense of welcome in any home. We offer a tremendous range of new, favorite and seasonal fragrances—from fall’s warm spices to holiday pine to spring’s first florals and summer’s most relaxing afternoons— all created to put the finishing touch on a gathering, a quiet moment or that very special event. This gift card is redeemable for merchandise from any Yankee Candle company owned store (not redeemable at independent Yankee Candle dealers), at yankeecandle.com, or from the Yankee Candle catalog. Except as required by law, gift cards may not be redeemed for cash or other gift cards. Gift card value will not be replaced if lost or stolen. Good toward new purchases only; not valid for previous purchases or orders in progress. There is no expiration date for this card, and additional value can be added after the initial purchase. www.yankeecandle.com. 1-800-545-6882 for balance inquiries. E-Gift Cards are redeemable in-store, online and over the phone. To check the balance of your E-Gift Card, call 1-800-545-6882. This E-Gift Card is issued by Yankee Candle Company, Inc. and may not be used for payment on any credit card account, to purchase another gift card, or toward previously purchased merchandise. This E-Gift Card is not redeemable for cash unless otherwise required by applicable law. If this E-Gift Card is lost, stolen or destroyed, Yankee Candle may replace it if you provide the E-Gift Card number. Replacement card will be the value of the E-Gift Card at the time Yankee Candle receives your report of loss, theft or unauthorized use. This E-Gift Card has no expiration date. Any remaining balance will be left on the E-Gift Card for further use. Maximum 2 E-Gift Cards can be used per transaction. Before placing an order, we strongly recommend you check the full Terms and Conditions on our website. For additional information, please contact us at 1-800-243-1776.